2018 was a great year for It’s Always the Heart! We focused on raising heart health awareness through social media, and I also had the opportunity to speak about the link between spiritual and physical heart health over the summer! In 2019, my goal is to continue to raise awareness between the spiritual and physical link of the heart, and the team and I have some great opportunities to make this happen. We are looking to plan our first It’s Always the Heart event. 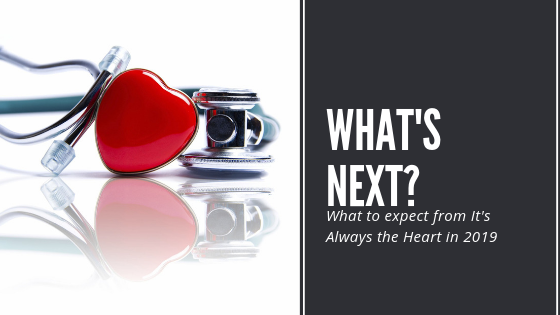 My team is planning a free heart clinic and each attendee will receive a free copy of my book, “It’s Always the Heart.” We are also working on a summer heart health resource for anyone interested over the summer months. And last but not least, we’ll be releasing a monthly newsletter giving holistic health insights into heart health. There are many great things on the horizon in 2019! There are many great things on the horizon in 2019! To accomplish everything we hope for in 2019, we’ve decided to partner with Amazon Smile. Amazon Smile is just like the online marketplace, Amazon, but there’s an amazing added benefit. Amazon will donate a portion of Amazon Smile purchases to It’s Always the Heart. Look for the official launch of the Amazon Smile and It’s Always the Heart partnership soon! As always, I appreciate your prayers and support as I work to help others uncover the mysteries that demonstrate the link between the spiritual and physical heart. Newer PostWhat Is Amazon Smile?